CVU celebrates Joey Parento’s (#12) goal in the first period of CVU’s game versus So Burlington on Saturday the 18th at Cairnes Arena. 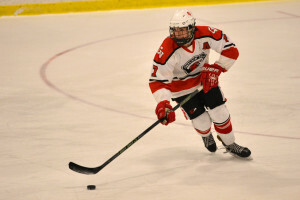 Richard Hall looks to” head-man” the puck during CVU’s game versus So Burlington on Saturday the 18th st Cairnes Arena. CVU goalie,Ty Parker, tips the puck over the top of the net during CVU’s game versus So Burlington on Saturday the 18th st Cairnes Arena. Jake Schaefer flips the back-hander into the goal during CVU’s game versus So Burlington on Saturday the 18th st Cairnes Arena.